Size, for one thing. 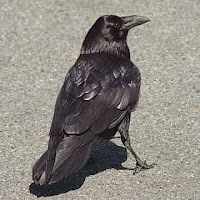 Ravens are much larger than crows, about the size of a hawk, where crows are more pigeon-sized. Crows have a high pitched cry, ravens calls are lower pitched and sometimes they even make these weird croaking sounds. "Sometimes it's easier to stay stuck in the experience of struggle. That's why you don't do what you know you need to do to move forward. When one get used to struggle, when the situation shifts to remove it, one doesn't always know what to do with the newly available energy. So you will find create something else to struggle against. Have you forgotten that you are a creator? When you see me, know that the time is right for the creative forces of the Universe to support your vision of a better life experience. Immerse yourself in the feeling of gratitude to draw new opportunities towards you. When you see Raven, magic is at play. Use it wisely."